It is now two years since we first fostered Alexi for you. 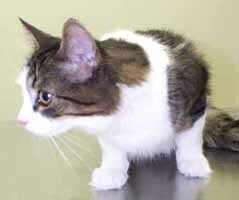 He was a lost kitten who had his rear right leg and hip amputated due to an unfortunate accident at an early age. We fell in love with him while fostering and subsequently adopted him. Alexi is still as charming and loveable as he was the first day we saw him. He is quite tiny; a friendly little fellow who gets to know everyone who comes to visit. He is intelligent, friendly,and endlessly playful. It probably has little to do with his disability but he is one of the most endearing cats I have ever seen - fluffy and bright eyed and always active. He greets us at the door when we come home and purrs and expects petting immediately. Who needs a dog when Alexi is here ? Most important, Alexi manages well with his three limbs. He doesn't seem to have any idea he is different. He walks, runs and jumps readily. His remaining hind leg appears to have almost shifted over to the middle to provide balance and stability. He has never had any injuries or illnesses related to the missing leg. Friends who are physiotherapists have remarked as to how successfully he appears to have made the transition to one rear limb. They have suggested that we have to take care to protect his back and ensure that he doesn't gain weight as he gets older but so far this is not an issue. If you have any other prospective adoptive parents for cats with a missing limb, please remind them of our very successful experience with our spirited little adventurer, Alexi. We love him to bits and certainly are proud of how well he has accommodated the loss of his limb.